In App-V 5.0, if you come across a sequenced application which will not launch because of error 0xFD01F25-0000007B , refer to the following symptoms and steps to resolve. It may not be the guaranteed fix, but it has worked for me as least once and may work for you too! 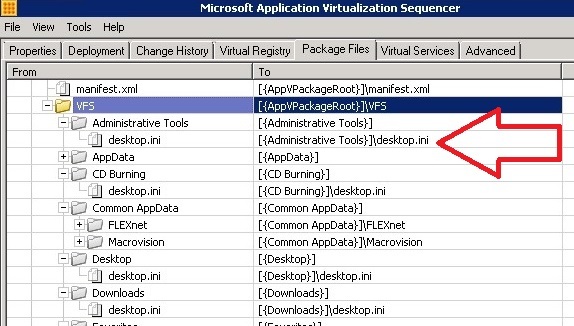 Within the VFS, delete every instance of a folder with just a desktop.ini file in it, and also delete and anything that is a “Library”. This entry was posted in App-V 5.0, Troubleshooting. I just finished sequencing Crystal Reports for Sage 2013 SP2 and noticed a crazy amount of extra folders that a didn’t expect to see. Not believe it would cause any harm, I left them in the sequence and was greeted to the 7B error. After reviewing your notes, I removed all of these folders from the sequence (including the libraries, which were there too), saved my application and it worked fantastic. Thank you very much for taking the time to write this up! SWEET! I’m glad it helped. Thanks for the feedback Joe. Hello … I seem to have run into this issue as well but before I go off and try deleting instances of a Folder with just a Desktop.INI file I need to understand why my Application is failing as it used to work. I suspect something has changed in my environment by another group within my IT department that has caused this. Or perhaps could this have been a Windows Patch?